Get everything you need for all your Christmas crafts in one pack. 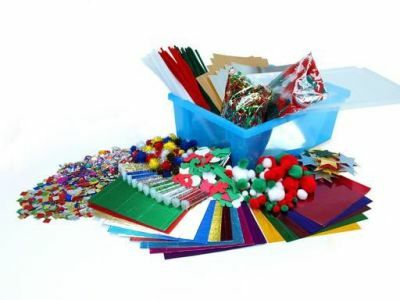 Suitable for all ages and ideal for classroom environments it has almost every craft accessory you can think of including EVA foam shapes, metallic corrugated card, silver/gold card, metallic shred, festive feathers, festive pipe cleaners, glitter and much more. All stored in a handy tray making it mess and fuss-free fun! A much more cost effective way than buying products individually, get it all in one!